Veiled Cake reveals elemental construction through a mask of frosting and spring flowers. Dotted Swiss Sweetheart Cake with darling rose and stock bouquet atop. 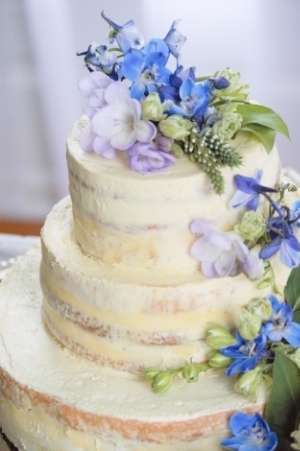 Casually Ruffled Cake with formal white lilies strikes a rustic and elegant balance. Silver Jordan Almonds, Dragees and Sugar Pearls are jewels on this simply sophisticated cake. Summer Berries accent this cake with a beautiful beveled edge.